Pesto is my new love, well actually not very new. I’ve liked it since the first time I tasted it, and for some reason I cannot remember where that was. Anyway, what matters is that once I had had pesto, there was no looking back. I moved to the US in 2012 and in the years since my exposure and appreciation of food from other continents, and even parts of Asia – like south-eastern cuisine from Korean to Thai, has grown. Thankfully, my love for this versatile dip is shared by my husband. Give us a bowl of pesto and bread any day or night! I was tinkering one afternoon, wondering what I could cook. I had herbs and spinach but no sunflower seeds, almonds (see my other pesto recipe) or pine nuts to make a pesto as I’ve done before. I did, though, have a good stock of peanuts. So that’s when the light bulb went on. Why not make a pesto with peanuts? That’s exactly what I did and was pleasantly surprised. 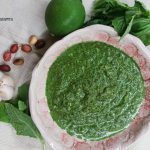 The spinach peanut pesto is not only full of flavour but also a breeze to make. So let’s get started! 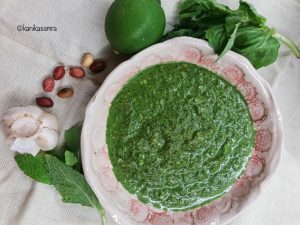 Spinach and Peanuts – a new pesto combination! Pesto needs herbs, lime, nuts and garlic. Roast on stove top – put a heavy bottomed pan on high heat, and warm it up. Then add peanuts and roast until done, about 5 minutes at high heat. The colour should be a warm maroon. Keep stirring otherwise the kernels can burn and the skin can blacken. Remove from the pan and keep it aside. Roast in an oven or OTG – transfer peanuts to a tray, put in the OTG and toast on the ‘toast’ setting for 5 minutes or until the skins are dark maroon. Each OTG is different, so keep a watch and stir them with a spoon every once in a while. Once done, remove from the OTG and keep aside. Next, wash and pat dry all the greens – spinach, basil and mint. Yes, this pesto has mint in it! 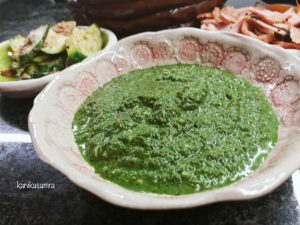 Summers to me are all about cooking with fresh herbs and using large quantities of homemade and very minty hari chutney. So, when it came to figuring out a new pesto, I had to take the risk of using mint, and it worked. Once all the greens are washed and patted dry, peel garlic. 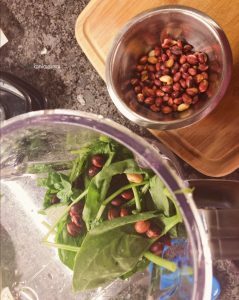 Now in a blender add all the greens, peanuts, garlic, salt and pepper – I add about 1 tsp or salt and 2-3 cracks of black pepper – and blend. Then add olive oil and mix. Squeeze lime juice and mix again. Taste. I skip parmesan quite often, since cheese isn’t a household favourite (the H man isn’t a fan!). If you enjoy the sharp flavour of parmesan, and that’s really what adds body to a good pesto, please add it! Adjust quantity by tasting but use at least 1/4 cup of grated parmesan. **NOTE: Since I do not add parmesan, my alternative to adding tartness is fresh lime juice. 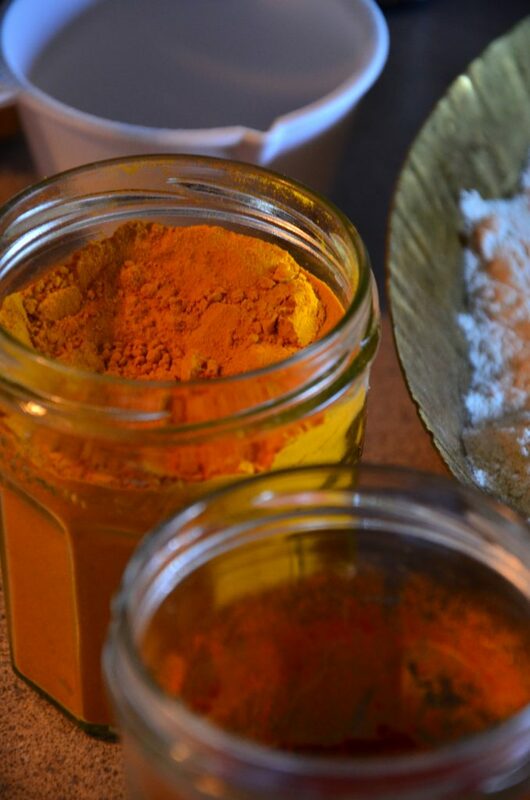 Another modification that can be made is to adjust the spice level. This dip is without any added spice in the form of chilli powder or fresh green chillies. So, feel free to add additional spice although it would move pesto into the space of chutneys, but if its tasty, go ahead! That’s it. Scoop it all out in a bowl and enjoy with your favourite bread, pasta, veggies or salad. A bowl of fresh pesto. 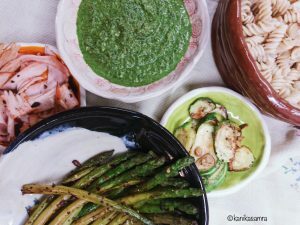 This Spinach Peanut Pesto is a nutty take on pesto infused with some of my Indian sensibilities. We enjoyed it with pasta, asparagus and zucchini sautéed with garlic and pepper roasted ham. Fresh and breezy – pesto makes all meals delicious. The Spinach Peanut Pesto is a nutty take on my favourite dip, the pesto. Try it for some added flavour and easy modifications that you can apply to other dips too. The first task is to roast peanuts. Roast on stove top – put a heavy bottomed pan on high heat, and warm it up. Then add peanuts and roast until done, about 5 minutes at high heat. Roast in an oven or OTG – transfer peanuts to a tray, put in the OTG and toast on the ‘toast’ setting for 5 minutes or until the skins are dark maroon. Next, wash and pat dry all the greens – spinach, basil and mint. In a blender add all the greens, peanuts, garlic, salt and pepper, salt and pepper, and blend. Then add olive oil and mix. Squeeze lime juice and mix again. If using parmesan, add now and mix again. That’s it. Scoop it all out in a bowl and enjoy. Since I do not add parmesan, my alternative to adding tartness is fresh lime juice. Another modification is to add more spice to the pesto. Add chilli powder if you want to make this a spicy pesto.